342 pages | 4 B/W Illus. 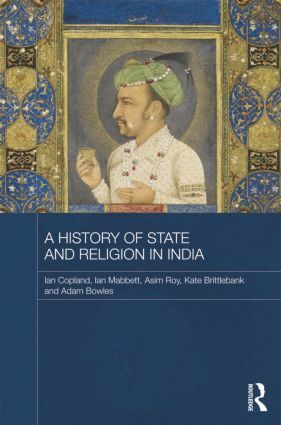 Offering the first long-duration analysis of the relationship between the state and religion in South Asia, this book looks at the nature and origins of Indian secularism. It interrogates the proposition that communalism in India is wholly a product of colonial policy and modernisation, questions whether the Indian state has generally been a benign, or disruptive, influence on public religious life, and evaluates the claim that the region has spawned a culture of practical toleration. The book is structured around six key arenas of interaction between state and religion: cow worship and sacrifice, control of temples and shrines, religious festivals and processions, proselytising and conversion, communal riots, and religious teaching/doctrine and family law. It offers a challenging argument about the role of the state in religious life in a historical continuum, and identifies points of similarity and contrast between periods and regimes. The book makes a significant contribution to the literature on South Asian History and Religion. Ian Copland is an Adjunct Professor in the School of Philosophy, History and International Studies at Monash University, Australia. Ian Mabbett is a Research Associate in the Monash Asia Institute, Australia. Asim Roy is an Honorary Fellow in the School of History and Classics at the University of Tasmania, Australia. Kate Brittlebank is an Adjunct Senior Research Fellow in the School of Philosophy, History and International Studies at Monash University, Australia. Adam Bowles is a Lecturer in the School of History, Philosophy, Religion and Classics at the University of Queensland, Australia.